quoted by the great houses of Champagne as the definitive guide to learning about champagne and reviewed by many of the world’s most prestigious wine reviewers including most recently Tamlyn Currin for the Jancis Robinson team..
CHAMPAGNE…A TASTING JOURNEY is a comprehensive introduction to the world of champagne, but importantly, it is a step by step guide to tasting and appraising champagne. 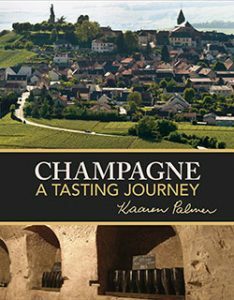 Palmer’s book is the first book of its type about champagne and undoubtedly will be translated into many languages as it becomes well known. A text book in many ways, but without any of the austerity or incomprehensible language one often finds in such books. Advanced, professional or beginning on your champagne journey this book allows you to select your level of interest at the moment and grow your knowledge over many tastings. with original maps, illustrations, photos, diagrams and flow charts.